Ward Shelley, “Downtown Body,” 2008. View an enlarged image here. More on the Downtown Body Project here. Thanks to Hannah Smith for pointing me in the direction of this print. 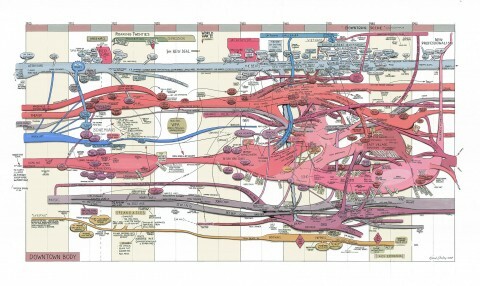 Both of my seminars this summer have read Calvin Tomkins’s profile of John Cage, published in The New Yorker in 1964 and collected the following year in his volume The Bride and the Bachelors, which also contained long reads on Jean Tinguely, Robert Rauschenberg, and Merce Cunningham. The anchor of that volume wasn’t Cage, but Marcel Duchamp, who was enjoying a renewed popularity among younger artists, including Cage and his followers. WNYC’s art blogger Carolina Miranda writes today about Ken Johnson’s new book on art and drugs in the 60s. Certainly illicit substances were motivating factors in the production of psychedelic, minimalist, and conceptual art, but lurking beneath all these is the man who forced us to ask what it would mean to draw a mustache on the Mona Lisa. We remain, in our most playful and intellectually alive moments, Duchampians. “The prophecies of Marinetti are coming true some of them, the wilder, more poetic ones”, so, gleefully, declares Allen in this quintessentially 1967 documentary film by Antonello Branca, What’s Happening? What, indeed, is happening? Poets and painters and a brash New York City just for that moment in time and space come together. Andy Warhol, Roy Lichtenstein, Robert Rauschenberg candidly speak (Andy speaks!). Allen appears first (around six and a half minutes in) being interviewed as he walks along the street and then (circa 3o minutes in) is seen holding forth at a street cafe. Gregory Corso makes a cameo appearance right at the very end (with a baby!). He gets the punch line. “War makes people crazy”. A little bit of Writing New York liveblogging here: Cyrus is, as I type, lecturing on Melville’s “Bartleby, the Scrivener,” which we situate in our course by taking seriously its subtitle, “A Story of Wall-street.” Today’s he’s added new material, inspired by a visit to the Hopper show at the Whitney (thru April 10). 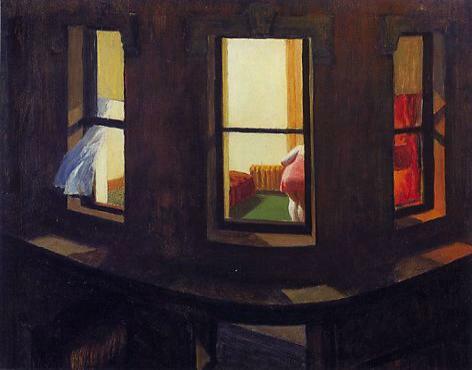 The connection, as I take it, is loneliness, but perhaps also voyeurism and the difficulty imagining the interiority of other urban dwellers. the night transit was even more interesting than the day, and that the fleeting intimacy you formed with people in second and third floor interiors, while all the usual street life went on underneath, had a domestic intensity mixed with a perfect repose. [The train allows one] to see those people through the windows: a family part of work-folks at a late tea, some of the men in their shirt sleeves; a woman sewing by a lamp; a mother laying her child in its cradle; a man with his head fallen on his hands upon a table; a girl and her lover leaning over the window sill together. What suggestion! what drama! what infinite interest! The couple thinks these views — better than attending the theater — offer ideal material for modern painters. Hopper appears to have taken them up on that point. Hey, kids. 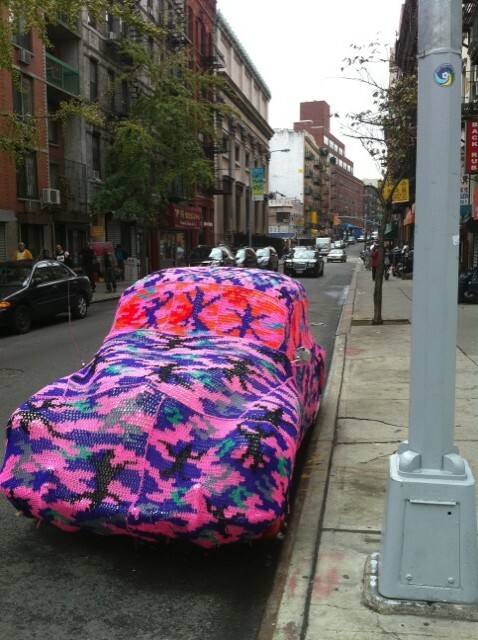 As previously reported on Bowery Boogie and tweeted by everyone who’s walked up Elizabeth Street in the last month, the Polish artist Olek, best known for knit–covered [make that crochet-covered] bikes outside Essex Market and elsewhere, has a show up at Christopher Henry Gallery (Elizabeth below Broome). The show, “Knitting is for Pus****,” closes this Sunday. **UPDATED with a slightly altered title, because obviously I didn’t get the joke in the show’s title, and clearly I don’t know the difference between crocheting and knitting. Over the last several weeks, as Cyrus and I have both been in and out of town — mostly out — and under multiple writing deadlines, we’ve let the blog languish. With luck, now that a new semester is upon us and we’ll be looking for relief from workaday woes, we’ll be back in action. I really regretted not being able to write sooner about a recent street art installation/performance/”Happening” commemorating the Battle of Brooklyn — and raising our consciousness about the invisible but very real presence of wars, historical and contemporary, in our daily lives. A street artist and high school art teacher living in Brooklyn, General Howe has spent the last two years installing street art that recalls New York City’s place in the American Revolution. 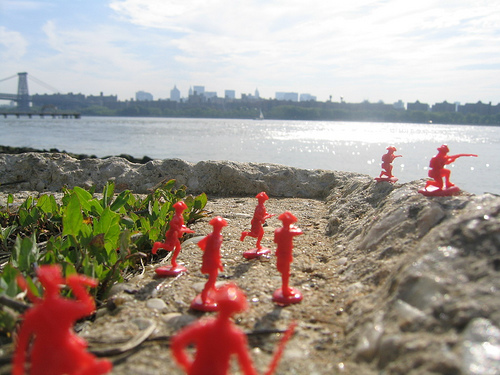 In the most recent wave of work, he was accompanied by social networking guru and self-described Art Evangelist Kianga Ellis, who live-tweeted Howe’s progress installing miniature figurines and wheat-paste posters, rain or shine, and Jaime Rojo of the blog Brooklyn Street Art, who captured the work in breathtaking photos. I have more I’d like to write about the whole conceptual structure of the work and event, but no time now. With luck I’ll get to come back to it. Meanwhile, if you weren’t following along, you can see General Howe’s retrospective on the event at his Flickr stream; Brooklyn Street Art interviewed General Howe for the Huffington Post. For more on the Battle of Brooklyn, see the useful site for Barnet Shecter’s The Battle for New York. I’m still on vacation out West and Cyrus, I believe, has been in Europe in his capacity as an associate dean of humanities for NYU Abu Dhabi. I’ve meant to post more often than I have but really, I’m on vacation, my summer’s short this year, and I just haven’t found the extra energy required. Still, for those four or five people who haven’t written us off completely yet, I thought I’d at least direct you to recurring features on two blogs I quite admire — both of which are ideas I’d had without being fast enough on the draw to execute. Seriously, though, this show would be much less interesting than I find it if it weren’t for some intelligent and bitingly funny Twitterers (including some of the show’s contestants) and the aftershow posts on the blog Art Fag City. Not only is the main commentary there usually spot on, but the comments threads tend to attract art insiders, including eliminated contestants, and TV insiders who have smart things to say about the way Bravo’s producers are shaping the narrative that emerges over the course of the season. For instance, this week someone in comments introduced us to the Reality TV insider term “Frankenbite,” a set of spliced-together comments from a contestant offered in voice-over to introduce or manipulate a particular narrative thread the show wants to foreground. For the most recent episode this problem emerged when Miles, the OCD (faux-CD?) Machiavellian manipulator and darling of the judges, apparently plotted to get his challenge-mate naked and masturbating as they prepared their piece. (The show comes with a Parental Advisory.) However, as one AFC commentator explained: “if you notice he is not on camera saying those things and the inflection of his voice is different between the parts.” AFC, reviewing the tape, agreed. Do I recommend Work of Art? Yes, especially if you have more than a passing interest in new art. But I wouldn’t recommend the show without the new and social media commentary it occasions. 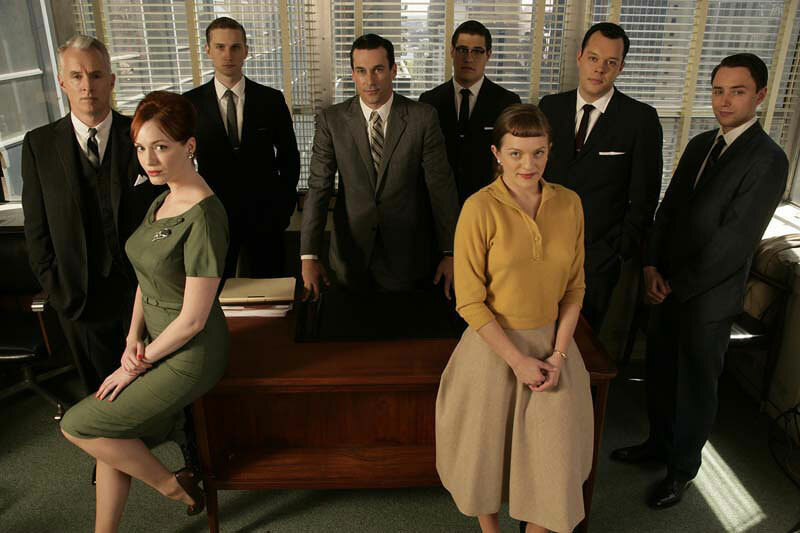 The same shouldn’t be said for Mad Men, which is, simply, terrific TV all on its own. Knowing that Cyrus was also a die hard fan, I suggested before the current season that we should start a series of Monday morning posts in which we tease out some interesting historical allusions or contexts from the prior night’s episode. The new season seems to have coincided with our summer travel, however, and it doesn’t look likely we’ll pull off this feature, at least not this season. But I’m thrilled to note that the intrepid and indefatigable Bowery Boys, among our favorite NYC history bloggers, have taken up the same idea and are offering post-show history lessons of their own. This morning’s post has to do with an allusion to the Ziegfeld Theater: “I’m not sure if Don Draper would have actually met anybody at the Ziegfeld in December 1964,” the Boys write, “as there were no shows running. Although perhaps NBC was still using it at this time as a soundstage; certainly Don might latch onto a script girl or production assistant while visiting a client filming a commercial.” If you’re into Mad Men, this talk-back feature over at BBs looks like a great way to start your week this season. I haven’t had a chance to preview the Lush Life LES group show yet. Curated by Omar Lopez-Chahoud and Franklin Evans (no relation to the Walt Whitman temperance novel), the show opens officially on Thursday evening at nine different LES galleries. As the name implies it takes its inspiration from Richard Price’s 2008 novel, which I’ve read twice and think quite highly of. It’s the sort of book that remaps your experience of place: it’s hard not to encounter the novel’s LES landmarks, some of them renamed or slightly repositioned, without thinking about the book and its characters. I’ve never seen the bridges from the top of the Al Smith homes, for instance, but whenever I’m walking St. James Place I can’t help but think about Price’s Clara Lemlich Houses, closely based on the Smith towers, and it’s easier to imagine someone else’s views — which is precisely what the book aims to have you do. I have been following Kianga Ellis’s tweets on the show @LushLifeLES and encourage Twitterers to give her a follow. (Facebook here.) I plan to hit the show’s nine chapters over the coming week — maybe even during the epic opening, if I can manage it — and promise to report back. Collette Blanchard Gallery, Eleven Rivington, Invisible-Exports, Lehmann Maupin, On Stellar Rays, Salon 94, Scaramouche, Sue Scott Gallery, and Y Gallery. LUSH LIFE adopts Richard Price’s 2008 novel to title and organize the exhibition. 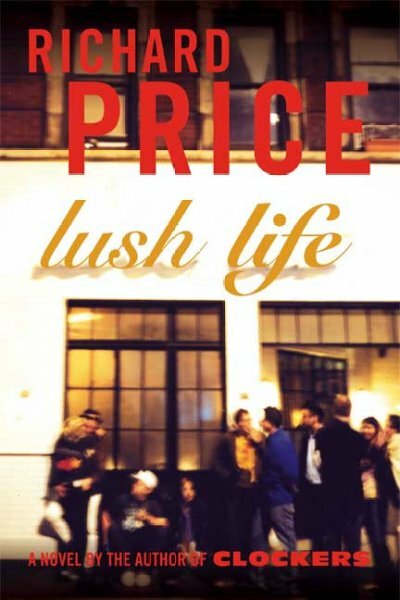 The novel is set in the contemporary LES and through a murder investigation exposes the dynamically changing community of the neighborhood, which despite its evolution retains a ghostly and vital link to its layered past. The deep and varied history of the LES now includes the LES galleries as new community members, and Price’s novel provides a potent vehicle for the consideration of community as voices compete for, ignore and occasionally share the same physical and conceptual space. The galleries will host concurrent exhibitions with each exhibition reflecting the idea of one of the nine chapters in the book. The curators selected one artist from each gallery to participate in the exhibition and solicited from each of them one additional artist recommendation of an artist not from one of the nine participating galleries (nine total recommendations). The curators then supplemented this base group of eighteen artists to complete nine exhibitions, ranging in size from three to twelve artists. LUSH LIFE will be the present for what will become a living ghost to the future form into which the LES will inevitably morph. The exhibition schedule varies slightly at each gallery with the earliest installation being June 17 and the latest closing being August 13. See gallery specific schedule below. Thursday, July 8th from 6 – 9 pm.